Wrapping up Preschool Week is a closer look at my custom Playmobil Poison Ivy figure. This is one of my simplest kitbash customs, because Playmobil released a Lady GaGa inspired Fi?ure which was pretty much all there in terms of the perfect Poison Ivy costume. Better still, the Lady GaGa head was the one with the domino mask, so I had to have it anyways so that head could be used for Harley. I merely had to give this body a more basic head and properly colored hair and, along with a flower headband: voila! 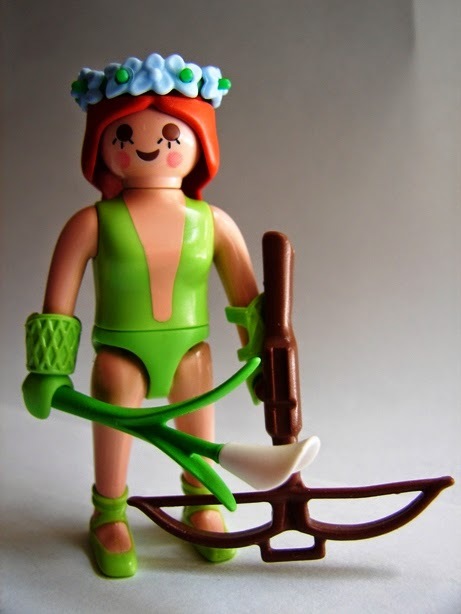 Playmobil Pamela Isley. The crossbow came later, when I found a bunch of Playmobil knights and weapons etc at a garage sale. And the lily came from the Hula Girl from Series 4. It looks unassuming, but I'm sure it's a poisonous mutation. Don't sniff it! Well that does it for Preschool Week. Time to stop all this childish nonsense and grow up to play with toys meant for the 6-12 age bracket! What are you all, a bunch of babies?!?! Pretty cool. Play-mobile ladies aren't very curvy.